Who Knew August 8 Is Such a Special Day? Yup, August 8 is one special day. 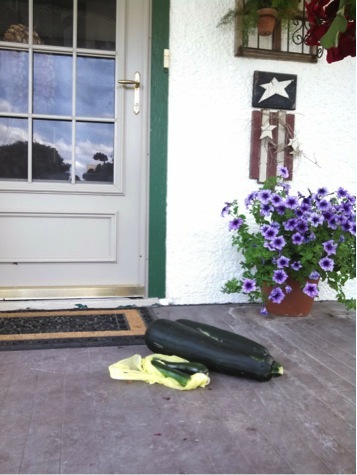 Who knew this day has been designated as "Sneak Some Zucchini Onto Your Neighbor's Porch Day?" Not me. But boy am I grateful for this timely designation. I naively planted three starts in May (yeh, yeh, I know now that one would have been more than enough). 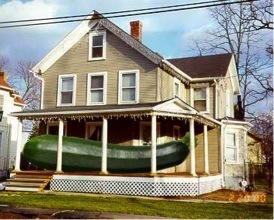 And now come August I've got zucchini coming out my ears. If you're a gardener, you can relate-either because you're smarter than me and dodged this predicament, or you're suffering the same fate right along with me. Fact of the matter, a small row of zucchini has the potential to end world hunger. So when August arrives, we gardeners are reaping far more zucchini than we can possibly use. We shred it like crazy and make bread, cookies and cake. We slice it and add it to our stir fries. We dice it and add it to salads. We steam it and top rice with it. We chop it and add it to soups, stews, and casseroles. We hollow the biggies out and let the kids and grandkids use them as boats in the wading pool. Sheesh-we're doing the best we can here. Still, the fruit matures on the vine faster than anyone can even pick it. We zucchini growers become desperate, so what do we do? Try to give it away, of course-family, friends, even strangers as they enter the post office or grocery store-anyone and everyone is fair game. So by August, even non-gardeners have had enough of the stuff. And the result? Everyone avoids us. It's really sad. Now before I head down the street with my wheelbarrow full of zucchini, I should say that I haven't been able to track down the creator or the origin of this day. But as a gardener, I can sure understand why someone proclaimed a day in August to creatively distribute the bountiful zucchini harvest. But I'll keep looking, and when I find this guy or gal, they're getting a big hug (and some zucchini bread) from me! Preheat oven to 400°F. Place zucchini in strainer; sprinkle with salt. Let stand for 10 minutes. Squeeze out moisture. 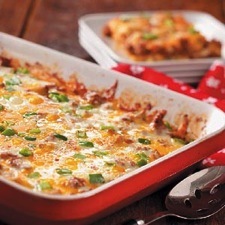 Combine zucchini with the eggs, Parmesan, and half of the mozzarella and Cheddar cheeses. Press into greased 13-in. x 9-in. baking dish. Bake uncovered, for 20 minutes. Meanwhile, cook beef and onion over medium heat until meat is no longer pink; drain. Add tomato sauce; spoon over zucchini mixture. Sprinkle with remaining cheeses; add bell pepper and olives. Bake 20 minutes longer or until heated through.